A few companies had some new ereaders on display at the Frankfurt Book Fair this month. A German ebook website called Lesen.net posted some YouTube videos from the Frankfurt Book Fair showing some new ereaders that are expected to get released in the near future. Among the new devices are a couple of new ebook readers from Boyue, the T65 and the T103. The Boyue T103 looks like one of the most interesting new ereaders in a long time. The Boyue T103 has a 10.3-inch E Ink Mobius screen with a resolution of 1872 x 1404, which equates to 227 ppi. That’s a different size screen than we’ve seen before, and the resolution is a lot higher than other 13.3-inch and 9.7-inch ereaders currently on the market. Plus it has a plastic substrate so it’s very thin and it’s also flexible so it won’t easily break. The Boyue T65 is another flush-screen 6-inch ereader. It’s very thin and it lacks the page buttons found on the current T63 models, like the inkBook Obsidian and the new Icarus Illumina. The software looks a bit different than what’s on the T63 so hopefully they’ve been working on updating the software as well. Boyue’s ereaders currently run Android 4.2.2. That’s pretty outdated by today’s standards and can cause issues because it’s incompatible with a number of apps. Does it have a front-light for night reading? Great! 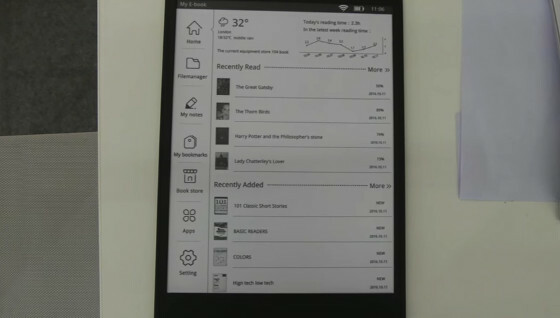 A new ereader with a 10+ inches display and plastic substrate! The T 103 seems fantastic! Price? Love it! Hope the price will not be too much expensive!